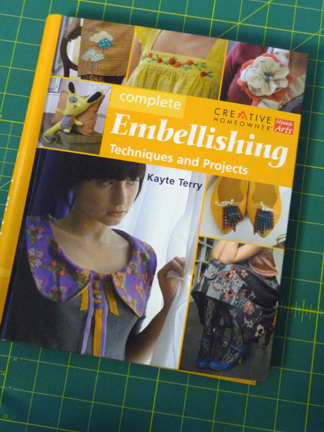 I was so excited when the mailman finally brought me Kayte Terry’s new book, Complete Embellishing. You might know Kayte from her blog, Love Forever, or her etsy shop, or remember that she was the very excellent stylist for Adorn (and before that, was a visual merchandiser for Anthropologie). So what I’m saying is, the girl’s got taste. Her new book is a veritable encyclopedia of embellishing techniques perfect to use for making your wardrobe fun again. The Deco Sweater–who knew bias tape could be so fun? 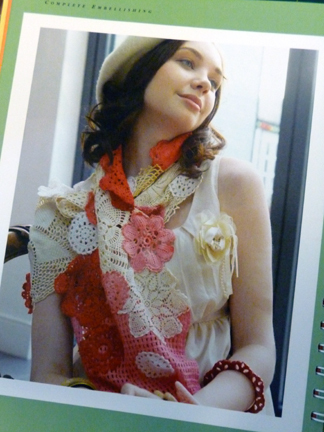 Bits and Pieces Scarf–I definitely have some doilies that need to be refashioned into this! Check out more pictures of the projects via Diane over at Craftypod or use the search inside feature at Amazon. This book is chock full of projects inside that are certain to inspire you. There are even a bunch of fun home ideas that would also make perfect gifts, like tea towels, embroidered napkins, lampshades and more. This book is definitely a worthy addition to your craft library for both the visual inspiration and the clear how tos. Here’s the best part: Kayte is giving away one copy of the book to a lucky Lindamade reader! Just leave a comment on this post by next Monday at 12 midnight mountain time (that’s 2 am EST or 11 pm PST) and I’ll randomly pick the winner. Good luck! Thanks for the review and photos--can't wait to read it! That deco sweater is gorgeous! That looks like a very cool book! Beautiful embellishments!!! I would LOVE to incorporate some of those ideas into my boring everyday wardrobe!